We are in the midst of Easter Week, named by some as "the Octave." It is the eight days following the celebration of the Resurrection of Jesus. Each day's gospel reading is an account of encounters the risen Jesus has with his followers. The Octave culminates with Jesus' encounter with Thomas, called "the Twin," in the Gospel reading for 2 Easter. To set this moment up: Jesus has appeared to the disciples in a locked, upper room of a home in which they have taken refuge. He bids them peace, breathes on them and blesses them. Thomas, the one who has in the past displayed, well, let's call it cynicism, is not present. He is, instead, one of the first to have the good news of Jesus' apparent resurrection proclaimed to him. Instead of rejoicing, he appears to recoil. He responds to the good news with a challenge: "Unless I see the marks in his hands, feet and side...and place my fingers and hands in those wounds...I won't believe." You can see what is coming. The next time the disciples are gathered in one place, and Thomas is with them, Jesus appears and immediately turns to greet Thomas. He offers his hands, and pulls back his tunic to show Thomas his side, with the wound from the Roman soldier's spear still there and open. He invite Thomas to do what he said he would do. Go ahead, Thomas. Touch, see, perceive, experience. Thomas does not touch, but he does perceive, experience and see...and then he proclaims Jesus, "My Lord and my God." There is something deeper happening, though. There is something there for us, the Church and for this world in the Resurrection experience that goes as deep, striking new life in us as a community, even as Christ's wounds struck mortal blows in the moments leading up to his death. 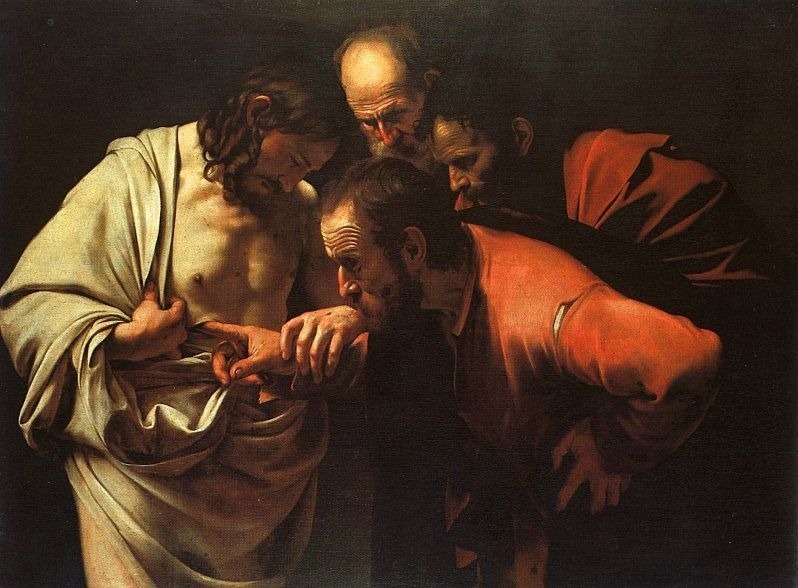 Jesus uses the moment to invite Thomas into a profound reconciliation with His death and resurrection by displaying his own wounds in order to help Thomas heal his. Thomas has wounds? Of course. Some of the deepest wounds we experience occur without the breaking of skin, or bones. They happen without overt, physical trauma. They happen to us while we are in and of relationships that should be safe, healing and reassuring. Thomas' wounds? He is hurt because he was left out of a moment the others got to experience after the horrors of the previous days loss of the Teacher. They saw him, first. They saw him and had their doubts and fears released. Their testimony to him of Jesus' return did not make him feel good. They did not bring joy. They instead cut his heart. He wasn't there. He missed out. He was left out of that moment, and now it will never come back. He faces the two things that shatter our relationships in community: He misses out on a moment, and he is isolated because he perceives others have left him behind, out of the picture. He responds as we do when those woundings happen. He rejects. He blames. He holds others to account because of what has happened (or in this case has failed to happen). I have experienced that wounding. You have, I am sure. You may be walking with a wound like that right now. You might have one that still aches when it rains. It might be so old now that the scar tissue has pulled tight and dry over it, leaving only a faint mark when the light hits it, just so. Still, we all know it. The wounding of being left behind, or of missing out, or of being rejected from inclusion. As a pastor, I have seen those woundings, and borne the responsibility-justified-or blame-unjustified-for the balance of my ministry. I have known the Church to be a place of healing and grace...and I have seen it wound people and break hearts. The Second Sunday of Easter, and this Gospel story of Thomas' reconciliation with Jesus stands as a singular summons we have as a Church that proclaims the Messiah's resurrection: our ministry, as Jesus models, is to labor for reconciliation in the face of the brokenness of human being. Jesus, with love, presents himself to Thomas and embraces Thomas' hurt and woundedness by offering his own wounds as testament and bridge to connection. Thomas is challenged to accept, and express, his own angers and resentments, allowing the light of love to shine on them. The blessing Jesus pronounces on him is one that reconciles them to each other, but it also commissions all present to carry that reconciliation forward and outward. We will inevitably stumble and fall as the Church. We fall short as leaders. We trip up as members. We hurt each other, and we are hurt by each other (two very different things!). We not only bear the responsibility and weight of those experiences, but we also wind up carrying them forward. We hold those woundings against each other. We foster and conserve resentment. We render those down into resolve and certainty. We reject calls for reconciliation because it means letting go of wounds that have come to be anchor points of self-awareness. We spurn opportunities to grow closer to each other through reconciliation because it would mean releasing not only our wounds to healing, but our pride and independence to reproach and our conflicts to resolution. Jesus tells us in his encounter with Thomas that THIS is the work of the community of the beloved. Not to be perfect, but instead to embrace our imperfection and continually work through it to a place wherein we find real healing and real restoration of relationship that is not above reproach, but has instead worked through it to a place beyond where God's love and peace abide and wait. That is a fearsome, and beautiful, task. To be willing to display our wounds, the ones Jesus through his own has offered healing, so that others might find healing in theirs. To be willing to let go of our control over our own hurt, our own resentments, our own certainties and proclaim with Thomas, "My Lord and my God!" means being willing to take on that new covenant of reconciliation in the name of the Christ who suffered and died, and yes, who rose again for us.